Good old American cooking at Chef Geoff's. 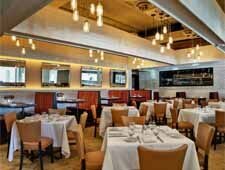 : Yet again, chef Geoff Tracy of DC and Virginia fame has opened another eatery, this time in Rockville. His all-American menus are attention grabbers --- starters run the gamut from “snacks” such as crispy plantain strips with guacamole to more standard appetizers like crispy calamari and crab cakes. As for entrées, the kitchen will meet almost any desire, from pizzas and sandwiches (try the short rib with sauerkraut) to burgers and lobster rolls. For dinner, think about steamed mussels or lobster risotto. Weekend brunch dishes coincide with luncheon fare, so if you want a burger and your friend is craving Brie-stuffed french toast, you are in luck. You’ll need to include dessert: try the Oreo bread pudding. Note that the restaurant is fully stocked with good brews and wines.